Some of my readers have noted that it’s been a while since I last made a blog posting. This is mainly because I’ve been extremely busy trying to prepare everything for my upcoming holiday. As I mentioned previously in this posting, this year will be a “year off” for me, so I will be spending a lot of time away from the house. This means spending time away from my “bedroom lab” of test equipment, the stable internet connection at home and my desktop computer equipped with a nice mechanical keyboard. Instead, I will be “making do” on the road with a laptop, a Windows tablet, and an Android phone. As I’m not someone who likes to invest in thin-and-light ultrabooks, as I find them overpriced and underpowered for the types of experiment I often like to run, I resort to living with a “fatbook”. This is very limiting in terms of battery life and convenience – it’s pretty heavy and takes up a chunk of space in the backpack. 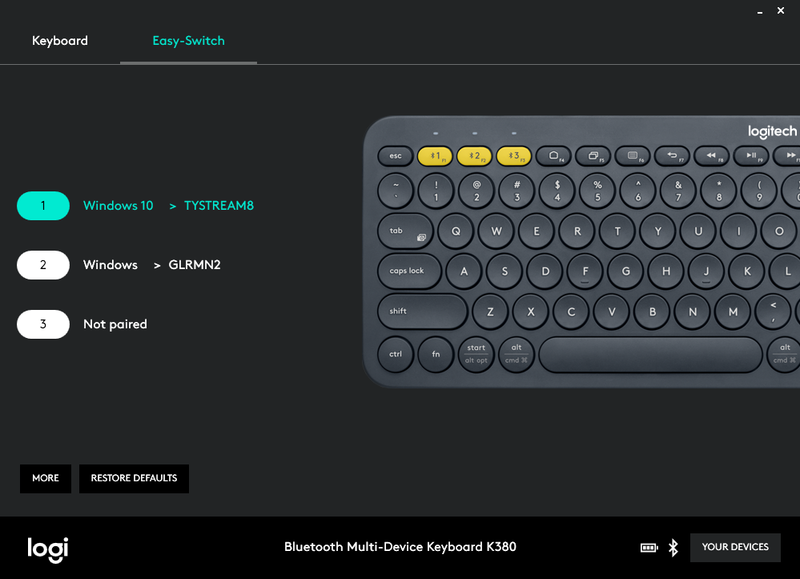 I had, at one stage, purchased a generic Bluetooth Keyboard and found it to be lacking. While I do own a Logitech M325, K400r and F710, they are all part of the “unifying” architecture which requires the use of a USB 2.4Ghz receiver. On a tablet, needing to use the only USB OTG port for that is both a waste and a big risk in case it gets karate chopped by accident. Bluetooth is the only option – the radio hardware is inbuilt. Searching the market, the number of Bluetooth options are still somewhat limited and the price is still somewhat at a premium. 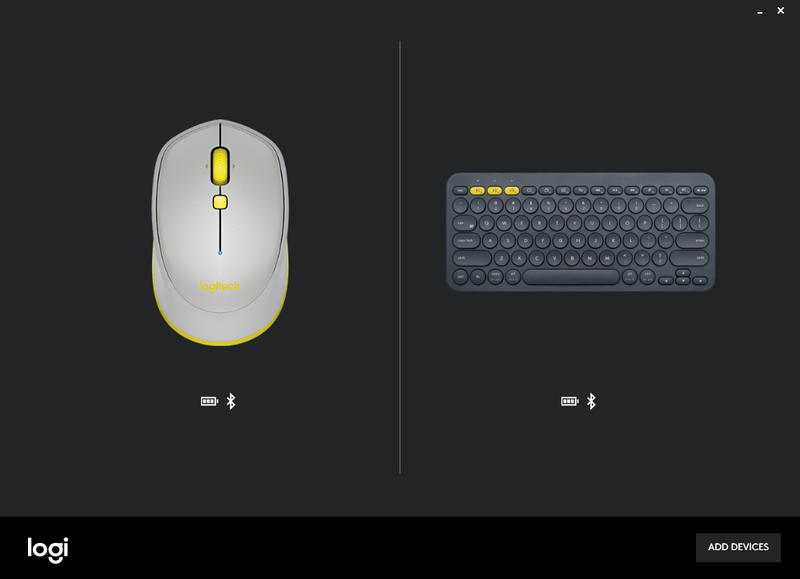 However, it is the price of productivity, and sub-standard input devices just will not do. I decided that the Logitech K380 and M337 best fit my needs and plonked down the AU$95 or so to buy both of them. The K380 comes in a colour cardboard box, which is mostly teal-green in colour. The product itself is an unusual dark blue colour (mostly) with white/grey letter printing, which makes it distinctive, but probably a little toy-like. The major drawcard of this unit is the ability to support three devices and switch between them, as well as the multi-OS compatibility that allows you to “type on anything”. The package claims a two year battery life, running on two AAA batteries. The spine features the full specifications, with support for Apple iOS 5 or later, Android 3.2 or later, Windows 7 or later, Mac OSX 10.10 or later, ChromeOS and Apple TV. It also is covered by a one year warranty. 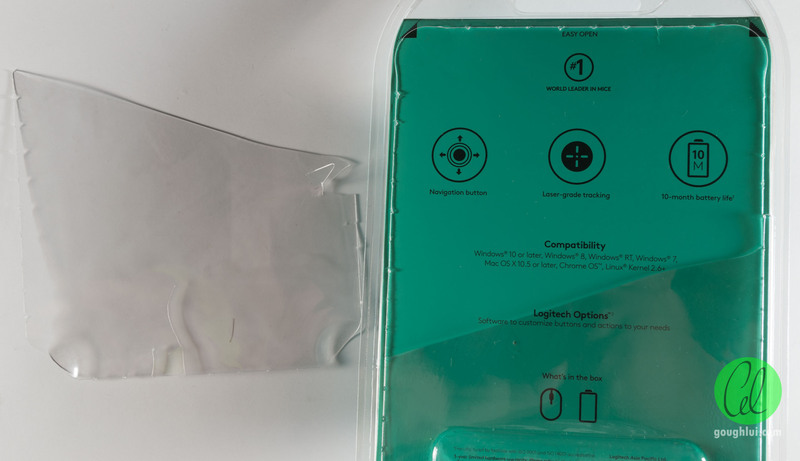 The keyboard comes wrapped inside a plastic wrap for protection. A small leaflet serves as the documentation, with the full guide available online for those who need it. Otherwise, you are guided by a pictorial illustration similar to those used in IKEA furniture on how to set it up. 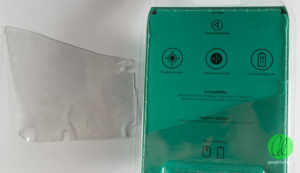 Batteries are included, and to keep their freshness, an insulating plastic tab is inserted at the factory. The tab is left hanging out for the user to pull, but I found pulling it awkward and instead caused the whole battery cover and batteries to dislodge anyway. 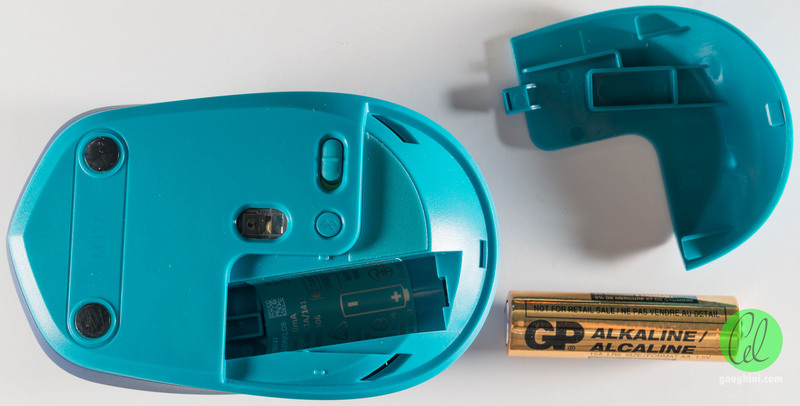 The two batteries included are GP branded AAAs, and the approvals information is printed inside the battery bay. While the colour makes it look a little bit like a toy, the keyboard itself looks a little more like an old-fashioned type-writer with its circular rounded keys. 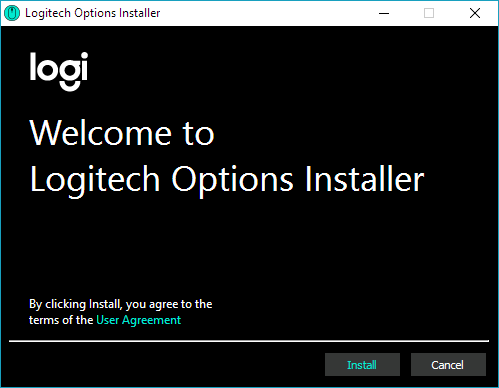 The new Logitech logo adorns the top, which looks a little minimalist, as well as three white LED indicators above each of the quick-switch buttons. To conserve power, a slide-switch with coloured insert is used to turn power on and off. An LED is provided next to it to indicate low-battery status. The unit is a little on the heavy side, tipping the scales at 421g. 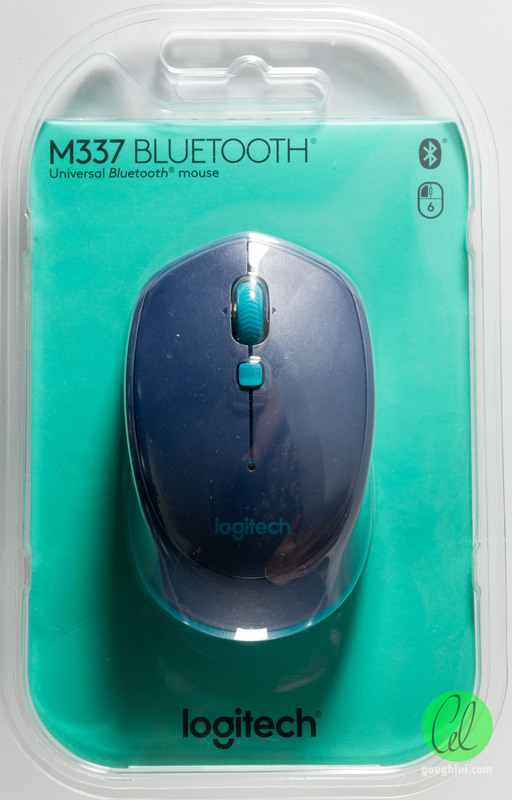 Unlike the keyboard, the M337 mouse comes in one of those “frustration” type plastic bubble packages. It has the same sort of colour scheme, and they did try to reduce the frustration by having the rear perforated for pull-open convenience, but instead, I found the plastic was too brittle and like to snap instead. The mouse claims a 10-month battery life, laser-grade tracking (which means it is an optical system), and compatibility with Windows 7 or later, Mac OSX 10.5 or later, Chrome OS and Linux Kernel 2.6 or later. The documentation is again pictorial in nature with a leaflet including the other information. The full guide is available online. The mouse features both click buttons, a scroll wheel with a centre, left and right click and a middle button (defaults to task switcher). 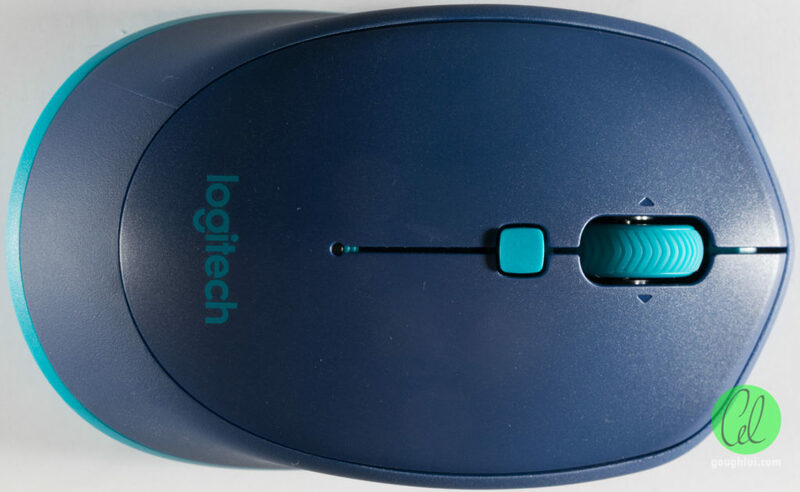 The profile is similar to other Logitech wireless mice, with a rubberized band surrounding the mouse. The top also has a light-pipe for a blue LED indicator which shows the Bluetooth connection status. One difference is the raised section in the rear, which can feel a little less comfortable as the lower end of the palm isn’t really supported. It is more conventional than some other more crazy looking mice from rival companies. This time, the battery is isolated with a white pull tab, but again, it doesn’t work well and instead needs to be removed by opening the battery door rather than just pulling on the tab. The unit is powered by a single GP AA cell, which fits a little more loosely than I expect (as is common to the M325 as well). 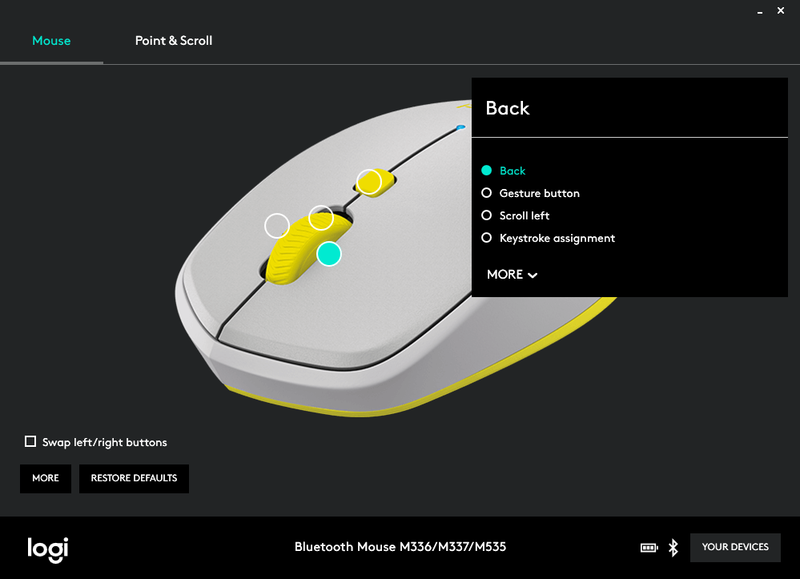 The unit has a slide switch at the bottom to turn off the mouse, and a Bluetooth pairing button to initiate pairing. It weighs in at a modest 81g. As both devices are “classic” Bluetooth, pairing proved to be simple and straightforward. The mouse paired without any need to authenticate, and the keyboard paired after a the generated on-screen code was entered on the keyboard (i.e. passcode). Thereafter, both peripherals functioned perfectly fine. Optionally, to change the behaviour of keys and read the battery status of the peripherals, the Logitech Options software can be used. Installation is straightforward, and just requires following the instructions. 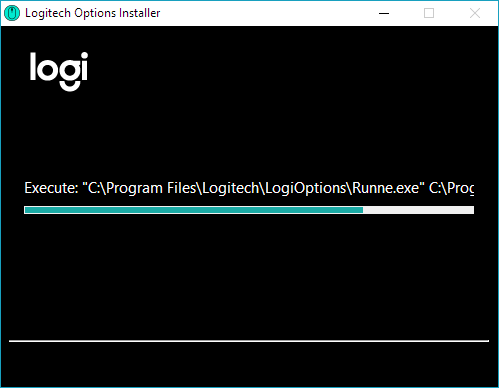 After installation, it detects any supported attached Logitech peripherals and displays their battery status. Clicking on a peripheral brings up the options specific to the peripheral. Note that I have changed some settings from their default to suit my needs. 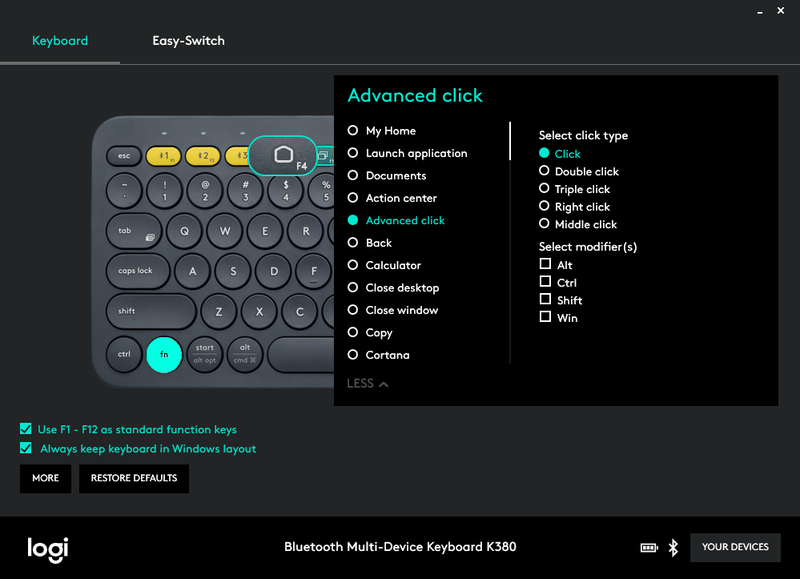 Some of the things you will find include the names and OSes of the paired devices, the ability to customize some keys with mapping to other buttons or macros, the ability to control how the Fn buttons work, and the ability to see the firmware revision of the connected device. 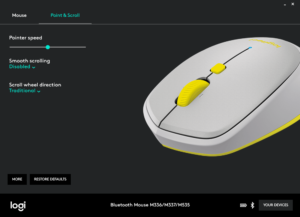 The customization features for the mouse are fewer, as expected, as there are fewer buttons to map. On the whole, unless you don’t like the defaults, there isn’t a good reason to install Options. On the contrary, if you are using an operating system which is not supported, you’re not really missing out on much. 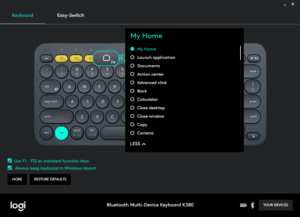 In normal use, I saw no issues with compatibility or signal range, with both keyboard and mouse working with my Windows tablet and Android phone across the whole room. 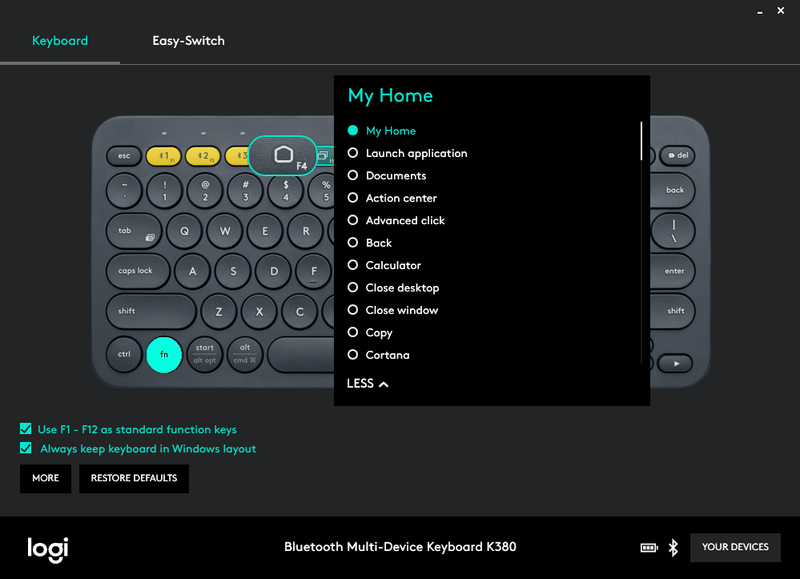 The keyboard also worked fine on an iOS tablet as well, confirming its automatic OS detection abilities to automatically select the most appropriate key mapping. 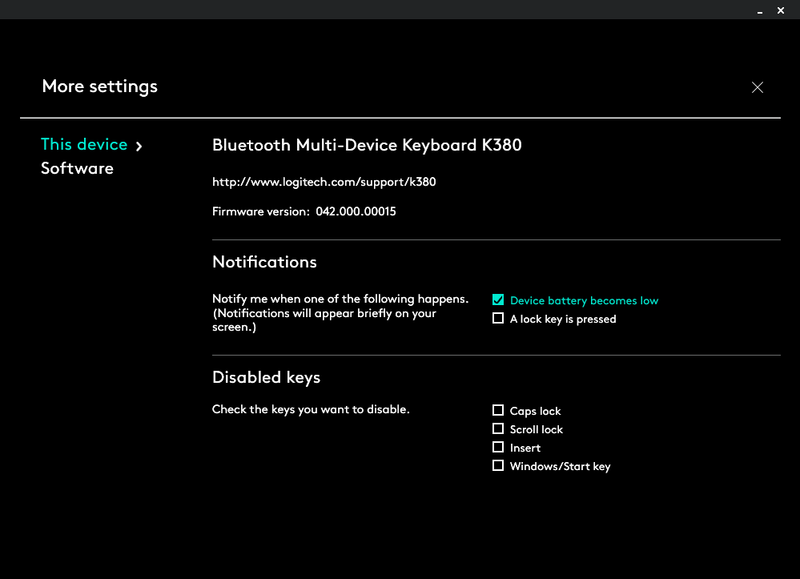 I found some pleasant surprises too, in the sense that the keyboard appears to have some internal buffer memory. 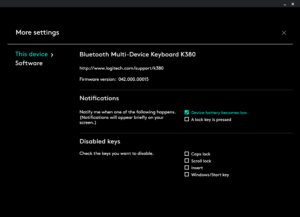 If you’re sitting at the login screen and the Bluetooth connection has not established yet, you can still go ahead and key in your password and “enter”, and the keyboard will try to make the connection and dump the buffer to the host, logging you in without any frustrating “waiting” for connection or invalid password on the first attempt. 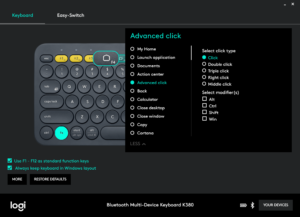 The three-device capability of the keyboard works well with power-users such as myself, who might want to swap from writing a document on the Windows tablet, to writing an SMS on the Android phone. This is accomplished using the light-blue keys and LED indications above them show you the pairing/connection status on changing from one to another. I experienced no issues hopping between devices. 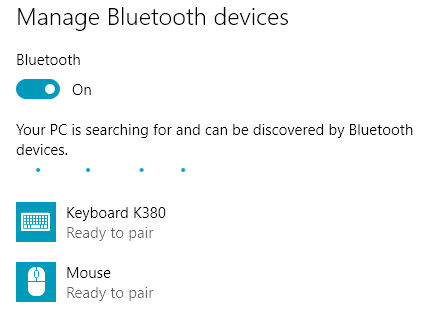 Sadly, it doesn’t seem the mouse has the same feature, which seems a little mismatched given the two devices visually look like they should go together. The keyboard travel is fairly short, although not much shorter than an average chiclet laptop keyboard. The keyboard features a reduced key-count, and the style of the keys are circular similar to an old-fashioned typewriter, with large gaps between the keys. This takes some getting used to initially, as the wider spacing between keys means that key-strike accuracy is a little more important, otherwise your fingers might land in the empty space between keys. However, after a while, it’s quite comfortable to use, and the cupped shape of each key also helps. The keys are quite consistent and feel solidly attached to the keyboard, and the rounded profile might help in case it is carelessly shoved into and taken out of a bag, as they might be less likely to snag on something. The keyboard is also impressive in the sense it has very little flex. It is possible to hold it in one hand and type with the other, without worrying about the board being damaged. However, this does come at a slight cost – namely that the keyboard itself is a little on the heavy side being about 400g. Definitely a consideration for those looking to take it in their carry-on luggage. The mouse has a shape that’s quite similar to other Logitech wireless mice, with a rubberized band around the middle. 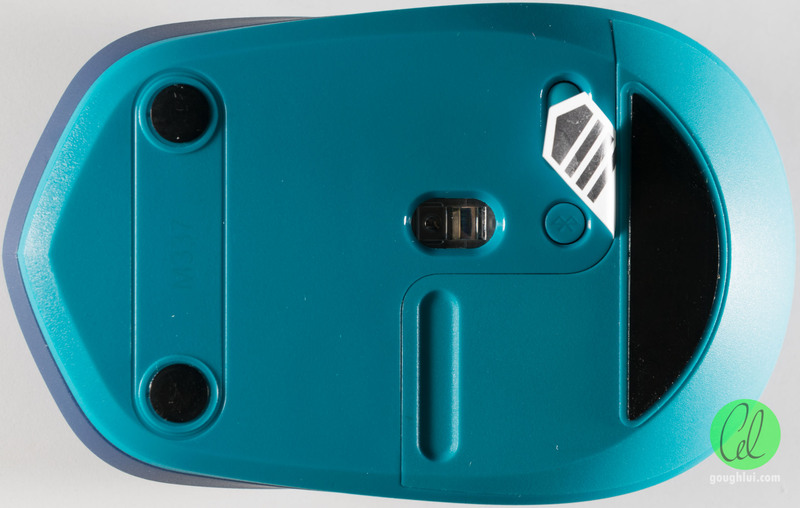 The mouse does lose a little bit of its profile towards the rear, which leaves the lower part of the palm hanging, and unlike the M325 I formerly used, the scroll-wheel is not weighted, so it doesn’t “glide”. Aside from that, it feels solid enough. The mouse claims to have laser-grade tracking, although from my experience, it is more akin to optical with occasional lag from idle. The light from the mouse is not visible to the eye, so I’m guessing it is probably infrared as it does come up a dim purple under a mobile phone camera. Both keyboard and mouse latency was found to be noticeable in some cases, although this probably is due to the processing overhead in the mobile device itself (e.g. it could be underpowered). But it is something to be aware of, as this latency may not be as apparent with a USB HID solution. Because Bluetooth uses 2.4Ghz, tablets such as the Iconia W3 which only have 2.4Ghz Wi-Fi will see reduced Wi-Fi performance while the Bluetooth peripherals are in use. 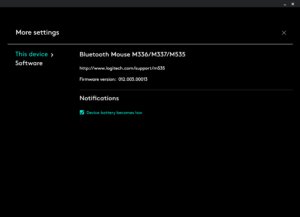 This is common to all Bluetooth devices. 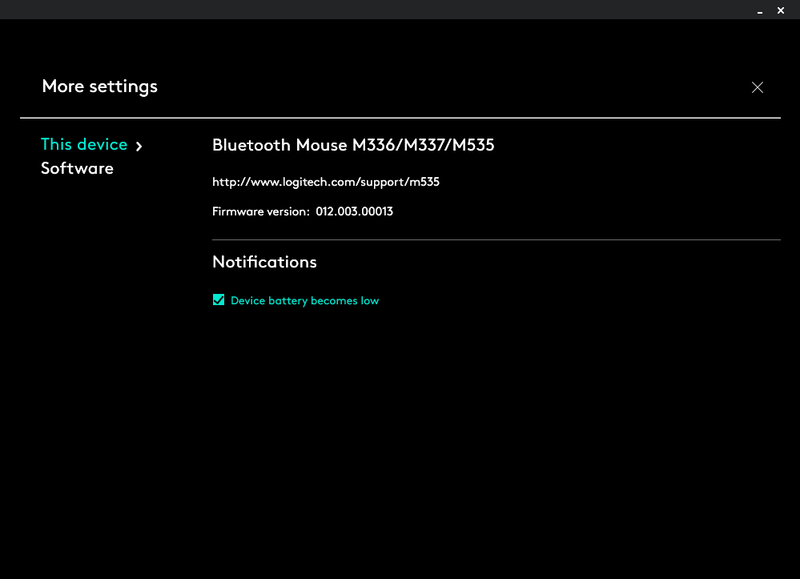 Battery life was not assessed as this is a relatively fresh acquisition, however, the claimed battery life of around 10 months (mouse) to 2 years (keyboard) seems to be quite exceptional. One downside is that the keyboard takes two AAA’s, whereas the mouse takes a single AA, meaning you still need to carry around two different types of cells. The battery cover on both is not captive, and the one on the keyboard seemed to be a little on the flimsier side. 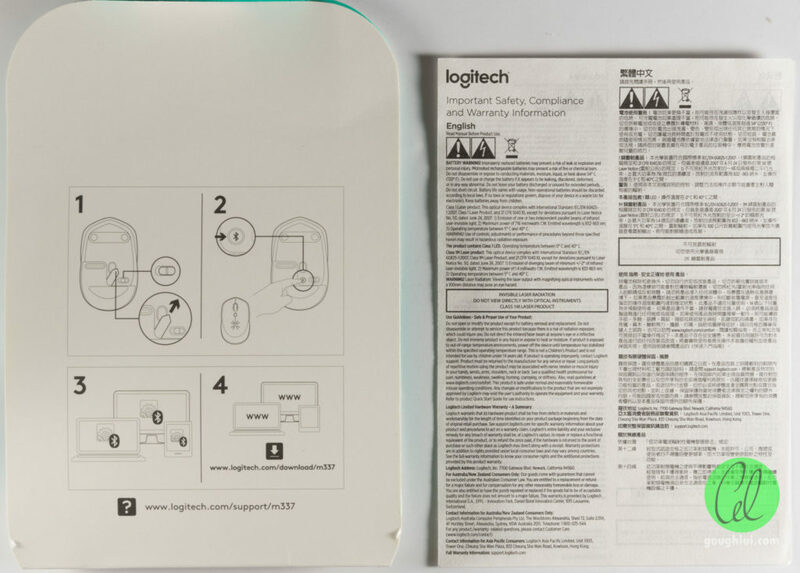 It’s nice to see the batteries are included, as is traditional for Logitech devices. While a little on the pricey side, the Logitech K380 and M337 are a good match for the road warrior that likes to use touch devices for more productive purposes. The keyboard is a little on the heavy side, but it is very sturdy and worked flawlessly after getting used to the circular-shaped keys and wide-spacing between keys. The OS auto-detection features are one of its biggest selling points, as it ensures the function keys behave as expected. The mouse is as sturdy as required, and not too weighty, performing as expected although without three-device capability like the keyboard, with a slightly less smooth scroll wheel and less comfortable profile compared to their other wireless mice. The colour may not appeal to all, but it does make it quite unique, and the claimed battery life is quite impressive. The proof is in the pudding – this whole review was written up on my Iconia W3 using both peripherals. It’s a mile better than working on the touch screen, and turns the tablet into a laptop-like experience. I’m glad I bit the bullet … otherwise I probably wouldn’t be doing any writing while I’m travelling. 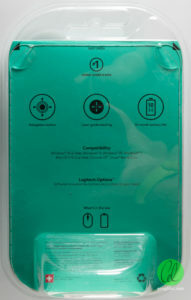 This entry was posted in Computing, Tablet and tagged bluetooth, computer hardware, made-in-china, mobile, tablet. Bookmark the permalink. 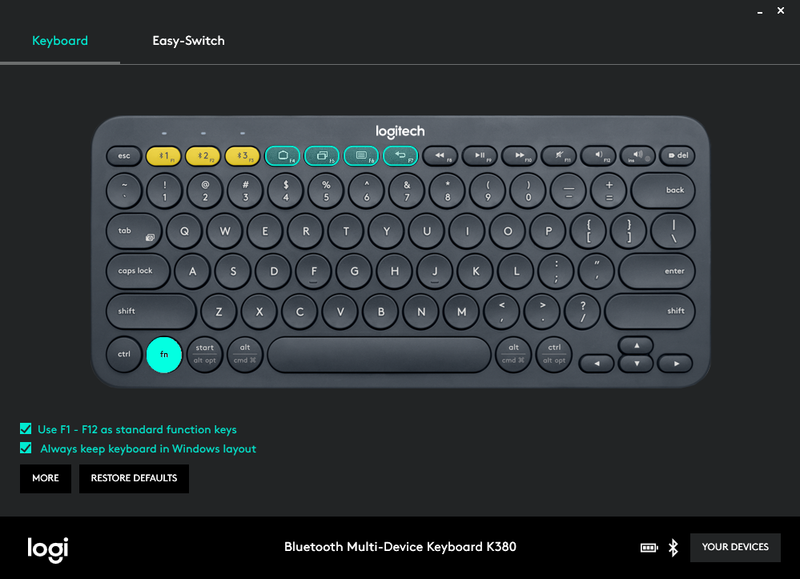 entry, but if so, let me communicate you that I have got 3 x BT wireless keyboards for tablet by Logitech and one is Solar BT Keyboard. The strange thing is solar module is placed at the reverside so no solar charging while in use. 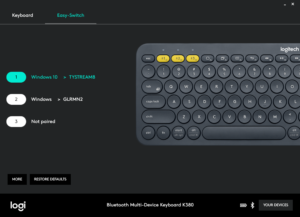 I have got one another Wireless solar keyboard by Trust since I really love solar stuff. Unfortunately not operational, no charging since I have no Li-Ion rechargable button battery. Last week I have got nice 7″ 3G GPS tablet as described above, generic 7″ tablet to test remote screen caast via WiFi (to make SmartTV to play youtube videos on TV). My one another 7″ tablet features TV DVB-T functionality. Unfortunately signal level is too weak (external antenna is not great). Last week I bought Car black box recorders ( one fullHD and another lower res but bigger screen). so I have tonnes of nice gadgets to test. Solar stuff might be nice, but practicality is often an issue. I find the whole idea of having solar panels near the battery to be a bad idea in general, as the cells when exposed to the sun will be operating at 50 degrees C or so, and batteries really don’t like being at high temperatures or they degrade much more quickly. As a result, I’d be happy to use a traditional “battery operated” device with rechargeable batteries which I can change myself and charge in any way I’d like (e.g. a panel connected by a long cable). Often you pay much more for a solar powered device as well, whereas the cells themselves are hardly expensive ($0.5-1 per watt-peak). 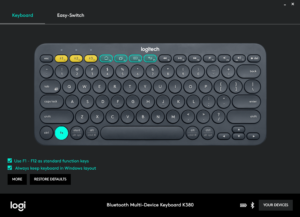 Ok, but if I get solar bluetooth keyboard for tablet by Logitech (second-hand) for $10, there is not much to worry about, since this is my first solar bluetooth keyboard for laptop. I am really happy today, having got bluetooth usb dongle for PC finally. It took me months to get one in retail sale at Carefour mall. Not sure what’s wrong with highly supplies of BT usb dongle for PC in Europe. I have built solar modules for years made of individual solar Si cells (4W 0.6V) sold by manager of solar company, good friend of mine. The problem while building solar modules made of Si 4W 0.6V , size 156mm x 156mm cells is highly complicated since an individual cell already delivers 4W, enough power for charging your smartphone. But you need a DC-DC inverter to supply 5V. There is no 0.6V > 5V DC-DC inverters on the market, so you need to solder a string of 6 cells to get 3.6V output voltage since 3V > 5V DC-DC lower efficiency inverters are on the market. so China solar manufactures cut 156mm x 156mm Si solar cell into smaller segments with a use of laser cutter and solder smaller Si solar segments into 5V or 12V serial string, since small power DC-DC down inverters are available on the market at pocket money price. My dream is to get 0,6V Dc-DC Up 5V or 12V inverter one day.